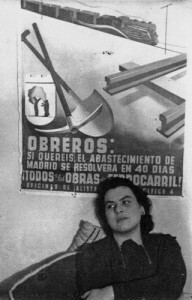 Muriel Rukeyser in front of a Spanish Civil War poster. Muriel Rukeyser (1913-1980) was an American poet who happened to be in Spain in July 1936, covered the Civil War as a journalist, and would revisit it time and again in her later work. Her previously unpublished Spanish Civil War novel Savage Coast has just been released, edited by Rowena Kennedy-Epstein (see here for a sneak peek in The Volunteer); Andrew Sullvan’s Daily Dish will feature her poetry throughout this weekend to celebrate her centenary.